I’m taking it upon myself to review as many Oktoberfests and Pumpkin Ales as I possibly can during the Halloween Season. All while listening to “Thriller”. Since I needed a break from pumpkin ales, I decided to go back to our old friend, the Oktoberfest Ale. It was while I was drinking this particular ale that I realized that I really don’t know what defines an Oktoberfest ale. What separates it from other ales? Age, mid-range alcohol content and an amber color apparently. Oh, and it has to be brewed in Munich, otherwise it’s not an authentic Oktoberfest beer. Which might be why Wachusett went with a slightly different spelling of Octoberfest here. Their beer is definitely amber in color, a nice red-orange glow that would look at home on a pumpkin ale. It’s light and airy and crisp, a perfect complement to a Fall day. It’s flavor is a little tart, a little sweet and very refreshing, if not overly complex. Unlike some other ales I might mention, it is not bland or lacking definition, but manages to find a balance between a light and pleasing flavor without sacrificing all of the complexity. I definitely recommend it for people who don’t really want to chug down a lager or any darker, more mysterious beer filled with things hiding in the abyss. This is a beer made for sitting and relaxing on the porch while the first Fall leaves begin to fall from the trees. I give it a smiling scarecrow, a goofy dancing skeleton and a couple of ears of corn. Also, you can probably only buy it in New England. 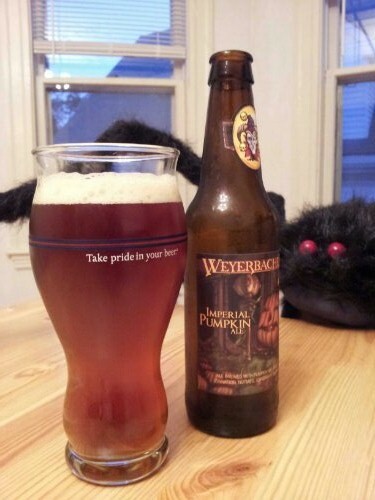 I’m taking it upon myself to review as many Octoberfests and Pumpkin Ales as I possibly can during the Halloween Season. All while listening to “Thriller”. For whatever reason, I’m incapable of not drinking pumpkin ales. It’s becoming a struggle for me. I use the reviews as a cover, but, deep down, I would drink the pumpkin ales anyway. Do you know how many I’ve bought to review and then just made disappear before even managing to snap a blurry picture of them with a monstrous spider in the background? A LOT. At first glance, it has the same orange-y hues that most pumpkin ales have, but it’s deeper and darker, almost red. It smells a lot like any other pumpkin ale, but maybe with headier blast of spices. It tastes a little like a subdued Pumking. No, that’s the wrong word for it. Not subdued. More subtle, not as bold a pumpkin flavor. But just as complex. Maybe MORE complex. Both beers are great pumpkin ales. They both deliver on spices and pumpkin and make you think of Fall with a beer, which is really all you can ask of a pumpkin ale. But Imperial Pumpkin Ale is more spice than pumpkin and is quieter and more sly. 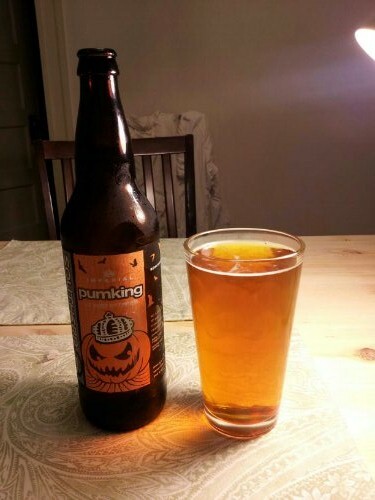 If you have a friend who thinks Pumking is too much for him, then go with Imperial Pumpkin Ale. They’re both royal. They’re both imbued with the power of Halloween. And they’re both really great pumpkin ales. Let me put it this way, before Imperial Pumpkin Ale, I thought Pumking was going to be the the best all season, but Imperial Pumpkin Ale has shaken my faith. I give Imperial Pumpkin Ale five Pumpkinhead-era Lance Henriksens. I’m taking it upon myself to review as many Octoberfests and Pumpkin Ales as I possibly can during the Pre-Halloween Season. All while listening to “Thriller”. As I mentioned in this earlier review, I don’t think Wychwood Brewery is selling seasonal brews; I think this is what they sell year-round. Which is great. There’s nothing better than going to your local liquor store and seeing a Hobgoblin or a Scarecrow on the shelf amidst all the IPAs and numerous variations of Guinness that are all deep, dark and weighty. While I love “Hobgoblin”, I am less enthused with “Scarecrow.” It’s a pale ale which are, to me, usually a bit less interesting in terms of flavor. They’re never too bitter. They’re not heavy. They’re not bursting with strange and unusual flavors. Pale ales are good for people who aren’t the biggest fans of beers, but need something to drink on a hot summer day. They’re light, refreshing and don’t leave a lot of aftertaste. You drink it down and look for the next one. And that’s exactly what “Scarecrow” is. There’s nothing truly interesting here. I don’t dislike it. But once I’m done with it, I won’t really be able to remember what it really tasted like. Honestly, the first thing I thought of when I took my first sip was a Heineken. It was really disappointing after “Hobgoblin,” a beer with interesting and complex flavors. I know this brewery is capable of more and I felt like they let me down. This is like watching Friday the 13th Part V and making it all the way to the end, only to find out that it wasn’t even goddamn Jason behind the mask. I give “Scarecrow” one Pyscho remake and a handful of direct-to-video Hellraiser sequels. The first thing you’re going to notice with any pumpkin ale is that they tend to have an orange cast to them, and Pumking is no different. Look at that orange luster. If you forget, even for a second, that you’re drinking a pumpkin beer, that color will always remind you. Around this time of year (you know, end of August, Halloween time), you can’t swing a dead black cat without sweeping half a dozen pumpkin ales off the shelf. There are some decent ones out there, but for the most part, the first thing you taste when you drink one is cinnamon. And the last thing you taste will be cinnamon. And in the middle there too. There is one out there that’s a huge offender in the cinnamon department, but I won’t be reviewing that tonight. But it’s coming. It’s coming. It’s like they’re not really shooting for the flavor of pumpkins and more going for the flavor of pumpkin pie. And then decided that would be too hard, so they just went with cinnamon instead. Pumking does have a cinnamonny flavor to it, but it’s more of a flourish at the end. The dominant flavor here, is the rounded, orange and nutty flavor of pumpkin. Imagine that; pumpkin flavor in a pumpkin ale. It’s robust and strong, a bulldozer of fall flavors and it just makes me think of the whole damn season. And we’re still in summer! To top it off, the label goes a long way to making it a strong Halloween beer. It claims it’s named after a creature of Celtic folklore and that it would waylay travelers. It has a scary story! On the bottle! Two beers in and I’ve already found two beers I would make people drink on October 31st. I give Pumking five Bluebeard’s wives and a Druidic blood sacrifice. Now, I know it’s too soon to celebrate Halloween, no matter what the candy section at your local grocery store is telling you. But I am, truly, unable to contain myself. I struggled with the best way to let off some of my Halloween steam early and then the thought struck me: While most people are probably not in the mood for horror movies and gruesome make-up tips, they’re always in the mood for my beer reviews. And, luckily, those same grocery stores are also shoving every fall and Halloween based beer to the forefront. So I’m taking it upon myself to review as many Octoberfests and Pumpkin Ales as I possibly can. All while listening to “Thriller”. 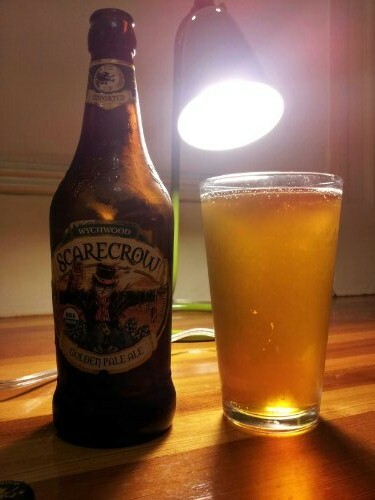 With a name like Wychwood Brewery, I’m going to assume that Halloween is a yearlong thing for these folks. Their two beers I picked up at the store had scary themes. I’ve already forgotten what the other was and I’m not getting up to check, seeing as how the kitchen is now more of a trek from my chair for me. This is a dark English ale (think Newcastle) , though not as dark as I’ve seen, it has a beautiful deep red color, which the photograph does not do justice. It’s very smooth tasting, surprisingly so and a bit sweet, though only a little bit. In all honesty, the first thing I thought of was apples. It’s a round, full flavor that just goes down so smoothly and without any lingering bitterness. I’m surprised. I’m generally wary of breweries that go to such lengths for what appears to be a gimmicky label (it has witches riding broomsticks on embossed on the bottle itself, for God’s sake), but this is a solid brew and at five dollars for a pint bottle it runs cheaper than some other specialty beers that go for 7, 8, 9 dollars for a pint. If you want a beer that gets you in a spooky, autumn mood, I can definitely recommend Hobgoblin. I give it fifteen severed heads. And a Jason Voorhees.